My Troubles with Teflon | Laura's "Rules"
Jokes about abusive relationships are, by definition, Not Funny. They are also tasteless and a tad tawdry, much like my former relationship with my darling Teflon. I now remember, with a little wince, how I spent years worrying over my Teflon, examining its placid, emotionless face for scratches and dings, using only the gentlest soaps and utensils, in the vain hope of somehow keeping it pristine and untroubled. I babied it, frankly, fussing at those around me to treat it similarly with a ginger hand, somehow believing that if only the surface would remain unscathed, things would be all right. Now I wonder, from the other side of things, why was I so scared? Why couldn’t I just leave it behind me? Was I perturbed by the thought of less perfectly formed eggs? Of spending precious time scrubbing that brownish cooked-egg scrum from the corners of some other, lesser, pan?? It was only when I learned about its sordid past, its ugly history of broken lives in a small town in West Virginia, that I knew that one of us had to change, and that one of us was me. My problem was not really the Teflon itself, but the bad company it keeps – the PFOAs (perfluorooctanoic acid) used to make it stick evenly to a pan. To be clear, PFOAs (or precursor chemicals called “fluorotelomers” that break down into PFOAs in the environment) are also used in Gore-tex, Stainmaster, and carpets. 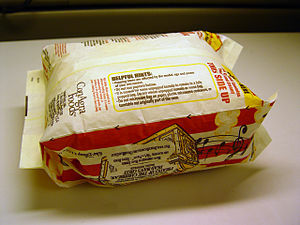 And popcorn microwave bag linings, and the inside of some fast food containers. Think really slick stuff. PFOAs are one slippery character, biologically speaking, as well. They’ve been found in animals in the Arctic, and – charmingly – form some of the strongest chemical bonds chemists have ever seen. The best part? They bio-accumulate in humans and animals, persisting, basically, well, scientists don’t really know how long, but likely approaching something like, uh, forever. On this question, as with so many others, the government is not of much help. The Environmental Protection Agency, in an early draft of a risk assessment, labeled it a “likely human carcinogen” in 2005. The agency has since stalled on the question. The agency’s Web site now says both that “EPA is still in the process of evaluating this information and has not made any definitive conclusions regarding potential risks, including cancer, at this time,” and that the agency, in “January 2006…asked eight companies in the industry to commit to reducing PFOA from facility emissions and product content by 95 percent no later than 2010, and to work toward eliminating PFOA from emissions and product content no later than 2015.” My translation: it may cause cancer. Please take a decade to stop using it. [PFOA] is a toxicant and carcinogen in animals. PFOA has been detected in the blood of more than 98% of the general US population in the low and sub-parts per billion range, and levels are higher in chemical plant employees and surrounding subpopulations. For evidence of this, look to “Teflon Town” – Parkersburg, West Virginia, the only place in the U.S. where PFOA is manufactured. Just today, one of the largest research studies on chemicals ever attempted announced a conclusion, after looking at the problem for over four years, that PFOAs are causally linked to prostate and testicular cancer. For some of its residents, who fought an Erin Brockovich-level struggle against the hegemony of DuPont, this is welcome knowledge, but really not news. The Tennants settled their dumping claim with DuPont in 2001. But that left the drinking water issue. As movingly described in Chapter 4 of “Slow Death by Rubber Duck,” Parkersburg citizens received a mysterious letter around the same time of the Tennants’ settlement, stating that PFOA levels in the water were safe – based on the considered judgment of PFOA-maker DuPont. Oddly, they weren’t reassured. They subsequently waged an unpopular campaign to bring the issues involving one of the town’s largest employers into the light, bringing suit against DuPont, and winning a novel settlement. The EPA also sued DuPont, for failing to disclose that workers at the plant had PFOA in their blood, proving that the company knew it starting at least as early as 1981. DuPont was fined a record $16.5 million in 2005. That lawsuit also turned up disturbing evidence that DuPont knew of health risks from PFOA way back in 1961, when rats exposed to PFOA had enlarged livers even after relatively low dose-exposures. Most revoltingly, in 1981, when DuPont conducted a study of female workers to see if birth defects were present among their children, it found that two workers out of eight had children possessing similar defects in the eye and facial area. Although these findings were like the birth defects found in their study of rats, the company merely transferred the workers, halted the study, and buried the results. The citizen lawsuit also got results, including a $71 million health and education project, a water treatment facility, and a landmark agreement to let a $20 million Science Panel conduct a detailed study of the health of town residents, to evaluate the link between PFOA exposure and health harms. So, after years of study, and a record number of blood samples from town residents (totaling some 70,000), the second set of conclusions are in. The first set of findings found a “probable link” between PFOA exposure and dangerous high blood pressure among pregnant women. It also found no link between PFOA exposure and birth defects and adult-onset diabetes, and some types of cancers. The only two cancers where the Panel found a reasonably consistent and strong relationship between past exposure and cancer were testicular cancer and kidney cancer. Both…are rare. In the Science Panel data there were 19 confirmed cases of testicular cancer and 113 confirmed cases of kidney cancer. After dividing the population into four categories…the kidney cancer rate in the upper categories of the population was 20%, 40%, and 60% higher for the 2nd, 3rd, and 4th quartile compared to those with the lowest exposure. For testicular cancer the corresponding numbers were 80%, 120%, and 170% higher for the upper quartiles compared to the lowest. The panel will wrap up its work by June of this year. So, what to make of all this? After all, at least eight manufacturers claim to be phasing out PFOAs (though they are replacing them, at least in some cases, with chemically-similar substances). Depressingly, cooking pans may not be the biggest source of contamination for PFOAs, as long as you always cook on low heat and never leave the pan empty (which I know we did, as I remember scolding my husband over it at least once, because I evidently privileged the health of my abusive Teflon boyfriend over him). The Teflon itself starts to off-gas at around 390°F, and at close to 500°F, you actually get a dangerous breakdown of the pan. While this sounds super-hot, a study in 2003 by the Environmental Working Group found that pans can actually get well over 700°F in 3 to 5 minutes. And there’s the issue of the non-stick coating under the burner area on the stove, or under the broiler. Fumes from over-heated pans can kill birds, and also have negative health effects for humans. So there’s that. 1) We chucked our non-stick everything. 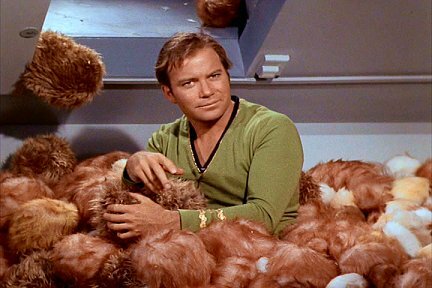 Like Tribbles, non-stick coatings were slyly hiding everywhere – the rice cooker, sandwich press, muffin tins, as well as frying pans. I recognize that DuPont says that there is little exposure from this cookware (uh, ok), but I don’t want to have to worry about off-gassing, heating points, and the like, and the story about Parkersburg really ticks me off, more or less on principle. We found a rice cooker, which we use all the time, with a stainless steel bowl on Amazon. We use enameled cast iron for every day, and regular cast iron when we have a big frying job. (Except for with tomatoes or acidic foods, as the iron leaches too much.) I don’t miss non-stick, really. Plenty of oil and a little extra scrubbin’ pretty much makes it work. 2) For carpets, furniture, and the like, we don’t use or have applied any stainmaster treatments. (I actively regret, but have not bothered to replace, the small loveseat purchased in the mid-90s with the stain-resistant shellack.) When I buy carpets, I look for organic untreated wool in colors that show fewer stains. Cheap carpets, I assume, are full of PFOAs and other ick. 3) We avoid stain-resistant clothing and Gore-Tex. And microwave popcorn, which tastes like buttery Gore-Tex anyway. 4) I turned back the allegedly “green and non-toxic” carpet cleaning guy, after he got to my house, because he couldn’t tell me what was in the murky blue liquid. Who knows? He certainly didn’t. I’ll just have to vacuum more. 5) We use green cleaners. Which I’m sure helps with a number of chemical hazards. 6) Because these kinds of chemicals are used, willy-nilly, to keep greasy fast food from sticking to containers, there’s yet another health-related reason not to eat, or let Maya eat, fast food. 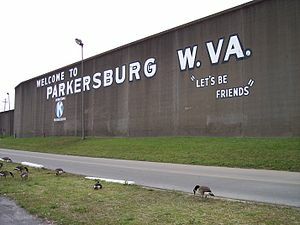 The story of Parkersburg may be the first environmental-disaster story in which a [corporation in a] small town is also responsible for contaminating the entire world and almost every living thing in it. Yikes. That’s one hell of a bad relationship. This entry was posted in Environmental Health & Safety and tagged C8, cancer, carpets, chemicals, coatings, DuPont, environmental health, Erin Brockovich, EWG, fast food containers, furniture, Gore-Tex, green, health, healthy, heating, microwave popcorn, mommy blog, non-stick, NPR, off-gas, organic, pans, parenting, parents, Parkersburg, Perfluorooctanoic acid, PFOA, PFOAs, Polytetrafluoroethylene, prostate cancer, safety, Science Panel, Slow Death by Rubber Duck, sofa, Stainmaster, teflon, testicular cancer, toxic chemicals, toxics, United States, West Virginia by Laura MacCleery. Bookmark the permalink. I switched to the “green” non-stick a few years ago. The product label claimed no PTFEs and maybe no PFOAs. Are these pans safe? I gave up microwave popcorn years ago and I’ve avoided teflon and anti-stain fabrics for years… but I didn’t make the connection to Gore-Tex. No more of that for this household. Thank you!